The students at École KLO Middle School are working tirelessly with the assistance of the school’s Green Parent Committee, against all odds, to try to restore the lost turtle habitat on their school grounds which has been covered by concrete pads. But this re-naturalization doesn’t just give the blue-listed Western Painted Turtles a safe place to grow up away from the school’s long jump sandpits. It will create a mutually beneficial learning and growing environment for the human and more-than-human inhabitants in the natural world at École KLO Middle School. These students need your help to get there. 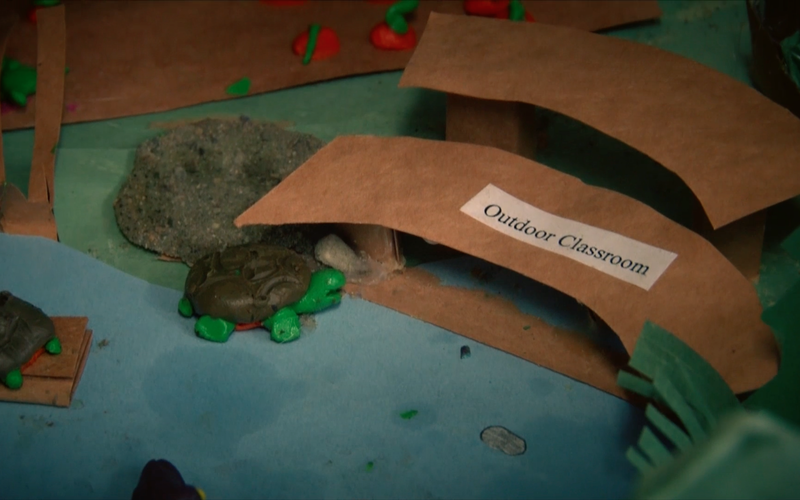 Your donation will give these students the outdoor learning environment they need to succeed, and the habitat the more-than-human students of École KLO Middle School, like the baby Western Painted Turtles that hatch in its sandpits every year, need to live. And for every donation of $10 or more, these students have volunteered to make a wooden turtle with your name on it to be installed in their outdoor classroom and turtle habitat, forever showing our gratitude for your support of their education. The students at École KLO Middle School have been working on a now seven-year struggle to restore the often flooded concrete-covered wetland habitat that once ran through their school grounds. Initiated by students’ discovery of blue-listed Western Painted Turtle eggs in their long jump sand pits, this school’s community began to restore the species’ disappearing habitat. Originally challenged to raise $100,000 their school board for this habitat’s restoration, multiple “generations” of students working with their teacher Michelle Hamilton and the school’s Green Parent Committee (comprised of KLO school parents, guardians, and “adopted” parents from the surrounding community) remarkably raised $86,000 Unfortunately, in an updated quote, these students recently discovered their project will now cost half a million dollars. Although dismayed and disappointed, through work on this issue, the students and teachers involved ended up creating a process of discovery- how the natural world is an educational resource gold mine. This project will be starting the first phase of its development this summer. This means a small section of the re-naturalization will take place but no more than that and the rest will have to be implemented over a longer period of time in subsequent phases. Although it is a good thing that this is actually beginning to happen, it is more intrusive and not as beneficial to the human and more-than-human natural community on the school grounds. The reason this has to be started is because it has taken so long to raise just a 5th of the funds for this project some of the grants these students have received are about to time-out. Unfortunately, going 7 years for every $86,000 is just not a feasible option for these students, the first “generation” of whom are now starting University. With your support, this doesn’t have to take the next 30 YEARS to happen, in a world of disappearing funds for the natural in education and a disappearing presence of the environment in the lives of young people, these students need their natural learning environment just as much as those baby turtles need this living environment.